We carry a variety of Native-Made Huron Bags and Change Pouches. See below for a gallery of items with descriptions, pictures, and pricing. These bags are made by the Huron on their reservation in Quebec, Canada. 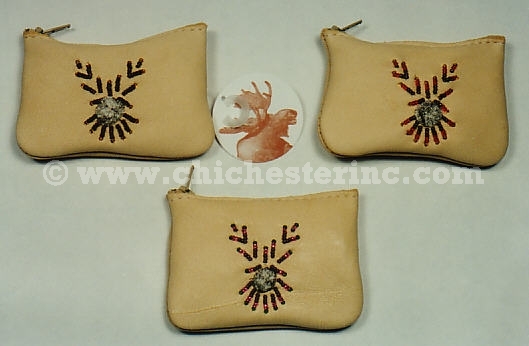 Moosehide change pouches are decorated with seedbeads and moose hair tufting. They have a zipper closure and are approximately 2.5" x 4" (6 cm x 10 cm). They are made by the Huron in Quebec, Canada. Each 2.5" x 4" (6 cm x 10 cm) Huron pouch, with zipper closure, comes in an assortment of Native designs. They are made by the Huron in Quebec, Canada. 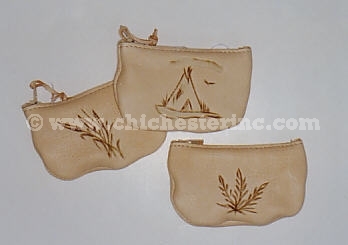 These 3 1/2" x 3 1/2" (9 cm) change pouches come in assorted designs (i.e., bear, moose). They are made by the Huron in Quebec, Canada. 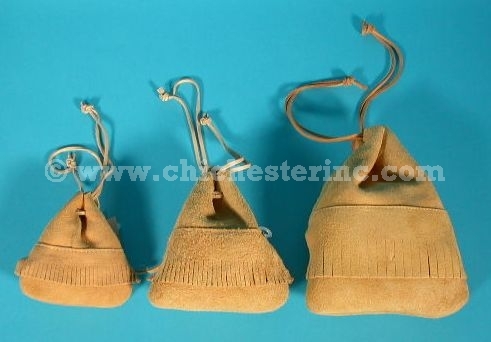 These 3 1/2" x 4" (9 cm x 10 cm) purses are made of deerskin. They each have a 50" strap and a Velcro® closure. They are made by the Huron in Canada.